Designed robotic jaws (shown below) and specified pneumatic gripper for picking parts to be welded. Gripper can pick over 30 parts of varying shapes (round, oblong or tear drop), can pick from outside or inside diameter of ring shapes and varying thicknesses (5mm to 50mm). Parts weighed anywhere from 1kg to 10kg. 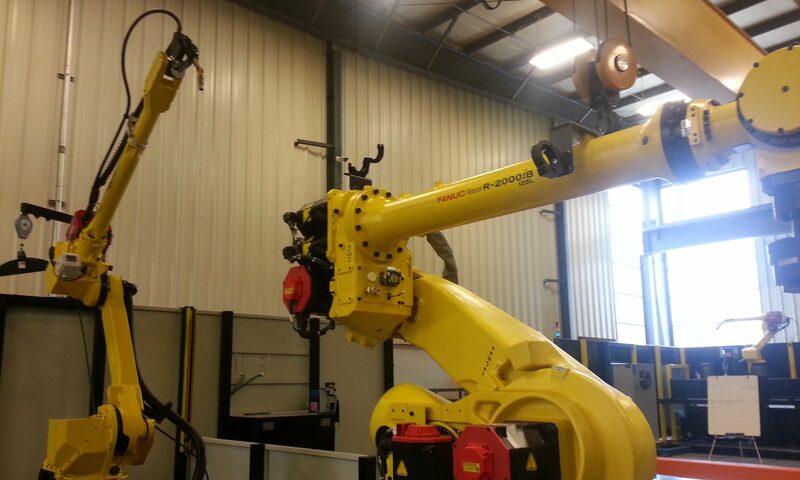 Designed this compact robotic welding cell from the ground up with the owner of Vizient, Mark Hann. Key requirements: small factory floor footprint, safety, palletized (moved whole with limited dis-assembly) and automatic flip floors that close when the door is opened. Built and designed motor life cycle tests and stations for fractional AC motors to test new rotor designs to reduce cost while also maintaining heat dissipation to prevent overheating issues. Used SLS, SLA to rapid prototype rotor designs. Course required electrical engineers, computer engineers and mechanical engineers to work together to perform tasks using a ROOMBA, a CBC controller and LEGO actuators. Designed and built Rube Goldberg Machine using KISS C++ controller (shown above) with servos and encoded motors. Sensors included push buttons, bumpers and light breaks. PID tuned and tested autonomous robot for dead reckoning. Built actuated gripper and color sensor on ROOMBA platform for detecting object colors and to retrieve the correct colored object using camera vision. Final project required the autonomous robot to navigate obstacles in a labyrinth using A* search, tracking the correct colored buttons and pressing push buttons with an actuated arm in the correct sequence while another robot retrieved colored objects in the correct order. Video from a practice run is shown below. Pardon the electronic music from 2010! Designed and built a hydraulically powered bicycle. The pump at the cranks was designed by hand to fulfill required volume of displacement to propel the hydraulic motor at the rear wheel hub. Built and tested a time lapse remote for my Canon DSLR. Based on interval timings for the camera, the IR LED sends signals at times designated in the code.